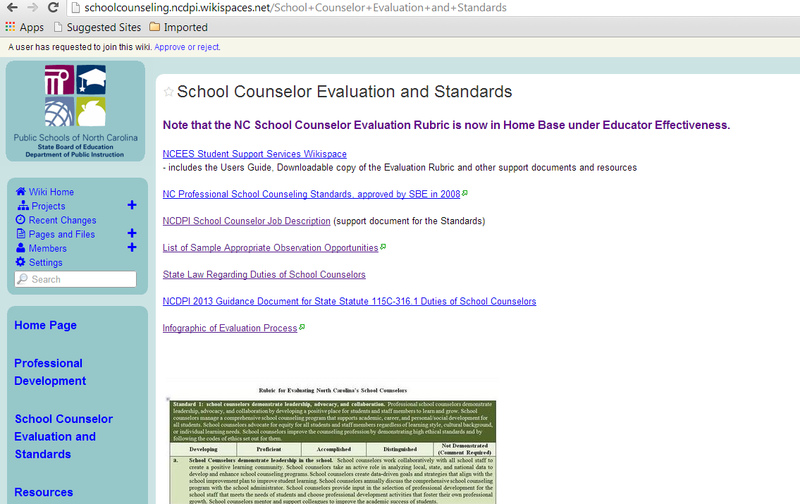 Download "How to Use School Counselor Standards to Your Advantage. Cynthia Floyd School Counseling Consultant NC Department of Public Instruction"
2 Objectives To increase understanding of the NC School Counselor Professional Standards and evaluation rubric and of G.S. 115C To enhance capacity to support and benefit from effective comprehensive school counseling programs that promote student and school success. 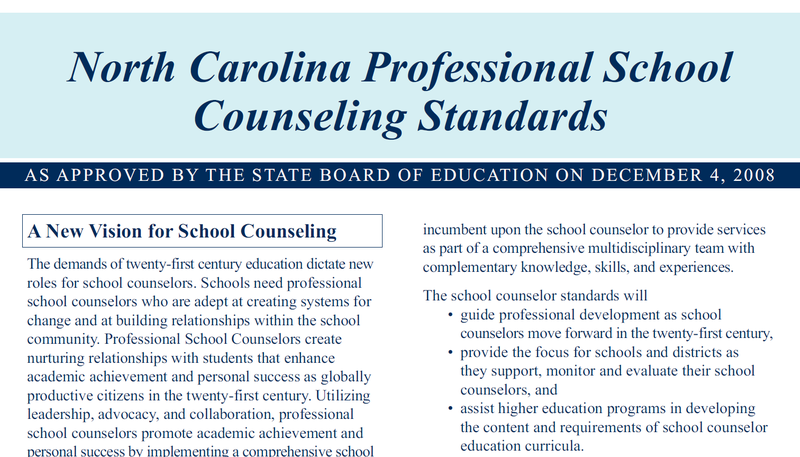 7 Vision of NC School Counselors NC State Board of Education, 2008 Schools need professional school counselors who are adept at creating systems for change and at building relationships within the school community. Professional School Counselors create nurturing relationships with students that enhance academic achievement and personal success as globally productive citizens in the twenty-first century. Utilizing leadership, advocacy, and collaboration, professional school counselors promote academic achievement and personal success by implementing a comprehensive school counseling program that encompasses areas of academic, career, and personal/social development for all students. 12 So what does the law really say? 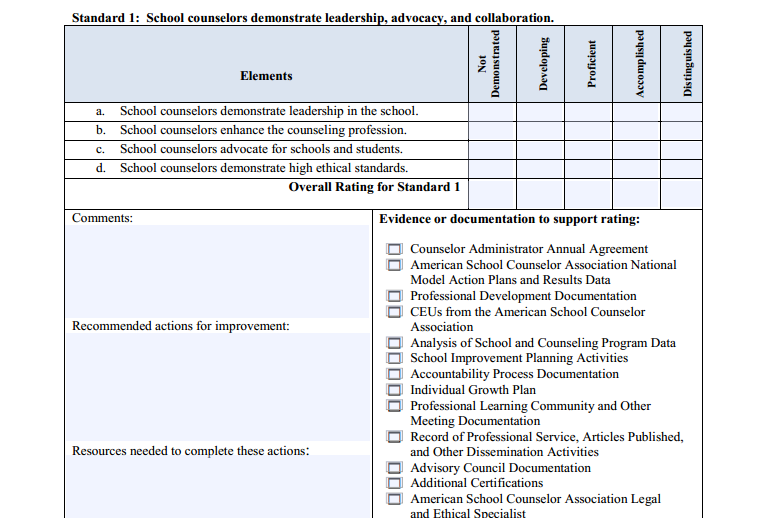 Basically, that school counselors are to spend the majority of their time being school counselors as defined by their State and national standards. 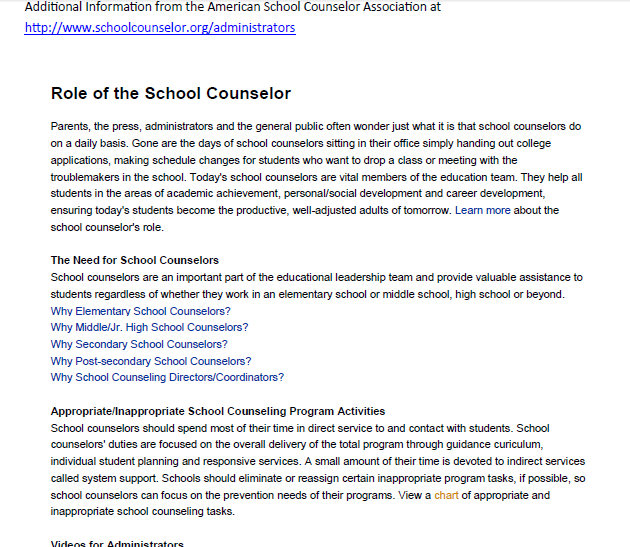 80% of the school counselors time in the delivery of counselor services to or for students 20% of the school counselors time in activities to support their programs such as participating in professional development, program planning, analyzing data from which to plan their services, collaborating with other staff, etc. 20 The Question to Answer is How are students different as a result of the school counseling program? 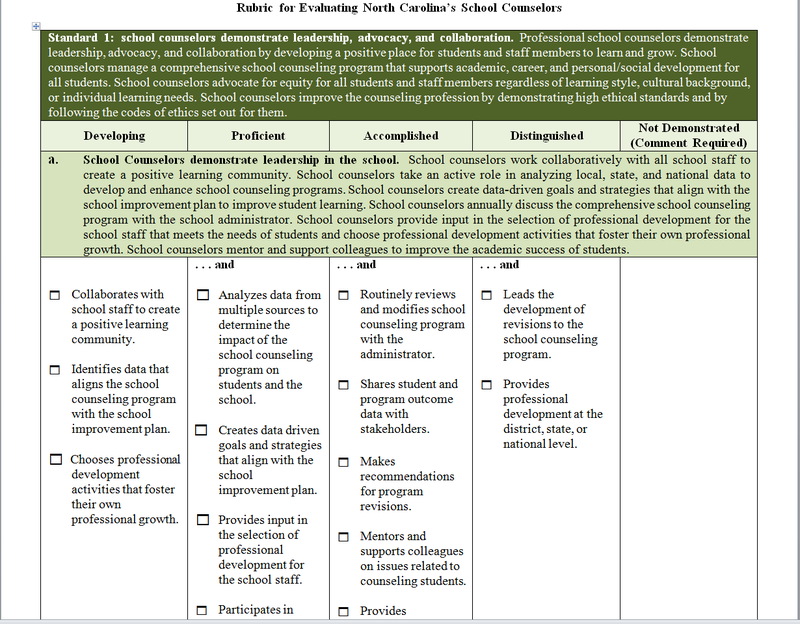 21 The performance evaluation rubric is based on the 2008 NC Professional School Counseling Standards Standard 1 School counselors demonstrate leadership, advocacy, and collaboration. Standard 2 School counselors promote a respectful environment for a diverse population of students. Standard 3 School counselors understand and facilitate the implementation of a comprehensive school counseling program. Standard 4 School counselors promote learning for all students Standard 5 School counselors actively reflect on their practice. 22 Standard 1 School counselors demonstrate leadership, advocacy, and collaboration. What does this look like? (examples) School counselors collaborating with other school personnel for school improvement School counselors reviewing school data and the school improvement plan from which they determine what school counseling services they need to provide School counselors advocating for initiatives that improve student success Potential barriers to this standard? 24 Standard 2 School counselors promote a respectful environment for a diverse population of students (continued) What does this look like? (examples) School counselors assisting students from all backgrounds with rigorous goals School counselors collaborating with other school staff on customized plans to address student needs School counselors collaborating with families and community resources to address needs Potential barriers to this standard? 26 Standard 3 School counselors understand and facilitate the implementation of a comprehensive school counseling program (continued) What does this look like? (examples) School counselors conducing school-wide activities in response to identified needs School counselors collaborating with teachers to integrate Guidance Essential Standards into other curricular areas Potential barriers to this standard? 28 Standard 4 School counselors promote learning for all students (continued) What does this look like? School counselors implementing activities that enhance critical-thinking, problem-solving and communication skills School counselors managing their time for 80% of time providing counseling services School counselors utilizing technology to support their programs Potential barriers to this standard? 29 Standard 5 School counselors actively reflect on their practice. What does this look like? (examples) School counselors maintain written plans of data-driven goals and strategies School counselors participate in professional development that will enhance their skills to accomplish their goals School counselors assess their activities and overall programs for effectiveness and needed changes Potential barriers to this standard? 32 How does all this coincide with NC GS 115C-316.1? Direct services shall consist of: (1) Delivering the school guidance curriculum through large group guidance, interdisciplinary curriculum development, group activities, and parent workshops. 33 How does all this coincide with NC GS 115C-316.1? Direct services shall consist of (continued): (2) Guiding individual student planning through individual or small group assistance and individual or small group advisement. 34 How does all this coincide with NC GS 115C-316.1? Direct services shall consist of (continued): (3) Providing responsive services through consultation with students, families, and staff; individual and small group counseling; crisis counseling; referrals; and peer facilitation. 35 How does all this coincide with NC GS 115C-316.1? Direct services shall consist of (continued):. (4) Performing other student services listed in the Department of Public Instruction school counselor job description that has been approved by the State Board of Education. 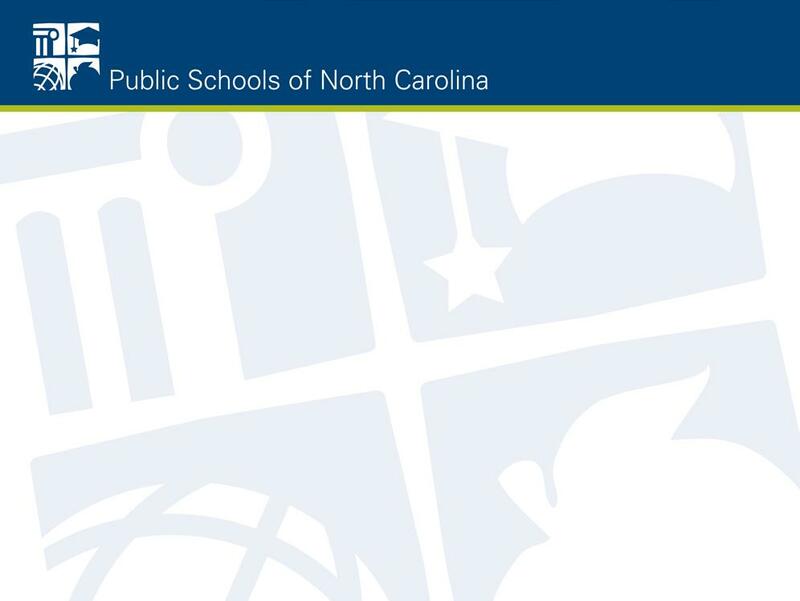 Introduction This document provides guidance to LEAs throughout the state of North Carolina for the implementation of G.S. 115C-316.1, the School Safety legislation clarifying the Duties of School Counselors. Implementing the ASCA National Model Patti Livingstone, M.S., LMFT Ramona Griffin, Ed.D. 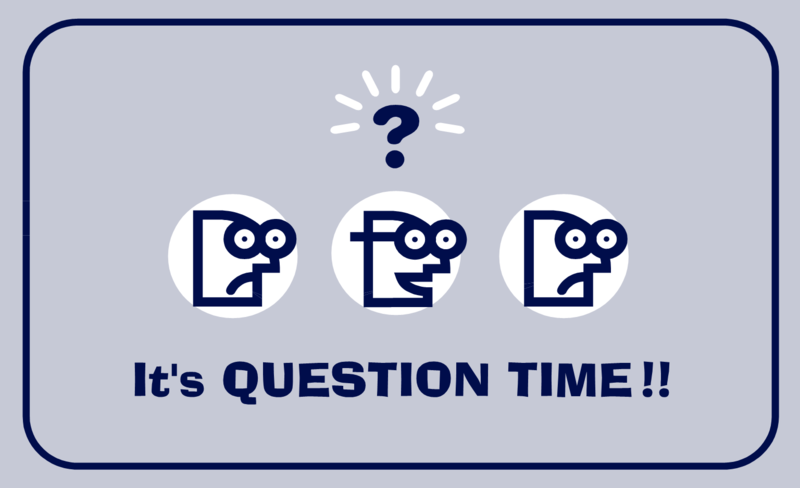 Corey Anderson, M.Ed., NBCT Introductions Name, school and school district How long have you been a school counselor?